A recent study in the journal Diabetes Care reports no positive benefit from continuous monitoring of pregestational diabetes in pregnant women. Women recruited for the study were diagnosed with either type 1 or type 2 diabetes prior to pregnancy. All women continued self-care in addition to the intermittent continuous glucose monitoring (CGM) protocol tested for the study. 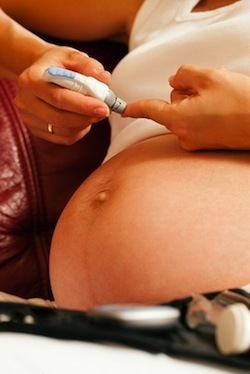 Researchers recruited 154 women with pregestational diabetes. The type 1 diabetes group consisted of 123 women with the remaining 31 placed in the type 2 group. CGM was used to track glucose levels for six day stretches 8 weeks, 12 weeks, 21 weeks, 27 weeks and 33 weeks gestation. Results of CGM were tracked by the primary care physician. Conclusion: CGM did not positively impact pregnancy outcome when used intermittently by women with pregestational diabetes. Real-time monitoring for pregnant women with type 1 or type 2 diabetes did not necessarily change overall disease control or reduce the risk of pregnancy complications associated with diabetes, including large for gestational age births or severe hypoglycemia. Source: Secher AL, Ringholm L, Andersen HU, Damm P, Mathiesen ER. The Effect of Real-Time Continuous Glucose Monitoring in Pregnant Women With Diabetes: A randomized controlled trial. Diabetes Care. 2013 Jan 24.